Hugo von Meijenfeldt was appointed Consul General for the Kingdom of the Netherlands in the 13 westernmost United States as of August 2013. He and his team, based in San Francisco and Los Angeles, focus on mutual investments in innovation: water and energy, food and nutrition, life science and health, and creative industries. 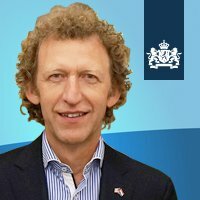 Prior to his current posting, Hugo was Deputy Director General at the Dutch Ministry of Infrastructure and the Environment. He was also Special Envoy for Climate Change at the Ministry of Foreign Affairs from 2009 until 2013. In this capacity, he chaired the Dutch participation in the global diplomatic activities to reach a climate agreement. Previously, Hugo was Director for Soil, Water and Rural Environment. He also worked several years as the Deputy Director for International Affairs, Chairman of the Committee on Environmental Policy of UN-ECE Geneva, and Head of the European Policy Division (including the EU Presidency in 1997). From 1982 until 1991, he was Legal Council in the soil clean-up division. Hugo earned his Masters in Public Law and Policy at the Free University in Amsterdam in 1981. He is member of the WorldConnectors and the Sustainability Challenge Foundation.